Background: Imatinib (IM) is a chemotherapy medication metabolized by CYP3A4 to Ndesmethyl imatinib (NDI), which shows similar pharmacologic activity to the parent drug. Although methods for determination of IM and/or NDI have been developed extensively, only few observations have been addressed to simultaneously determine IM and NDI in biological tissues such as liver, kidney, heart, brain and bone marrow. Methods: A validated LC-MS/MS method was developed for the quantitative determination of imatinib (IM) and N-desmethyl imatinib (NDI) from rat plasma, bone marrow, brain, heart, liver and kidney. The plasma samples were prepared by protein precipitation, and then the separation of the analytes was achieved using an Agilent Zorbax Eclipse Plus C18 column (4.6 × 100 mm, 3.5 µm) with gradient elution running water (A) and methanol (B). Mass spectrometric detection was achieved by a triplequadrupole mass spectrometer equipped with an electrospray source interface in positive ionization mode. Results: This method was used to investigate the pharmacokinetics and the tissue distributions in rats following oral administration of 25 mg/kg of IM. The pharmacokinetic profiles suggested that IM and NDI are disappeared faster in rats than human, and the tissue distribution results showed that IM and NDI had good tissue penetration and distribution, except for the brain. This is the first report about the large penetrations of IM and NDI in rat bone marrow. Conclusion: The method demonstrated good sensitivity, accuracy, precision and recovery in assays of IM and NDI in rats. 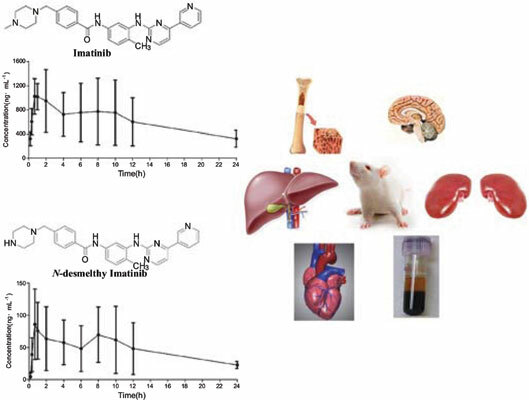 The described assay was successfully applied for the evaluation of pharmacokinetics and distribution in the brain, heart, liver, kidney and bone marrow of IM and NDI after a single oral administration of IM to rats. Imatinib, N-desmethyl imtinib, LC-MS/MS, pharmacokinetics, tissue distributions, bone marrow, Imatinib-d8.